I've had this recipe pinned for a little while, and finally had all the ingredients to make it. Ooh la la. This is SO delicious. 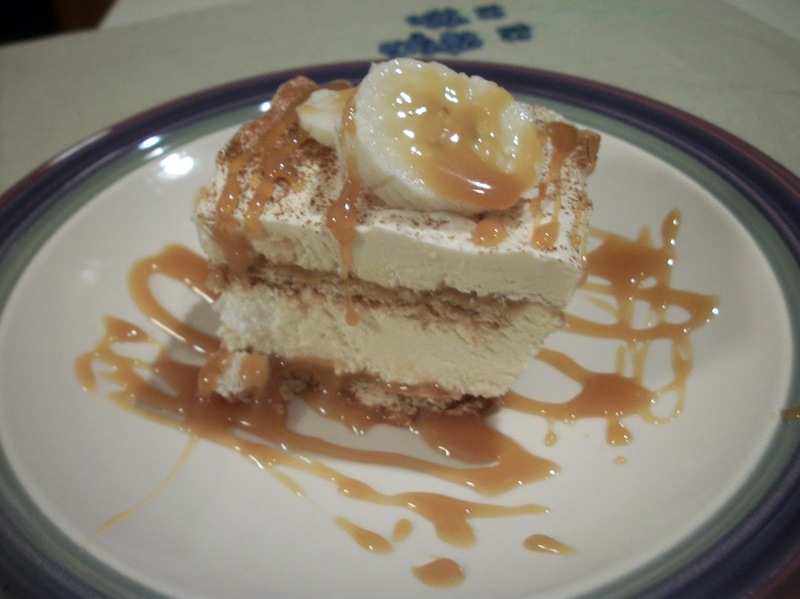 Weeks later, I am still being asked, "Is there any of that caramel banana dessert left?" It was a big hit. 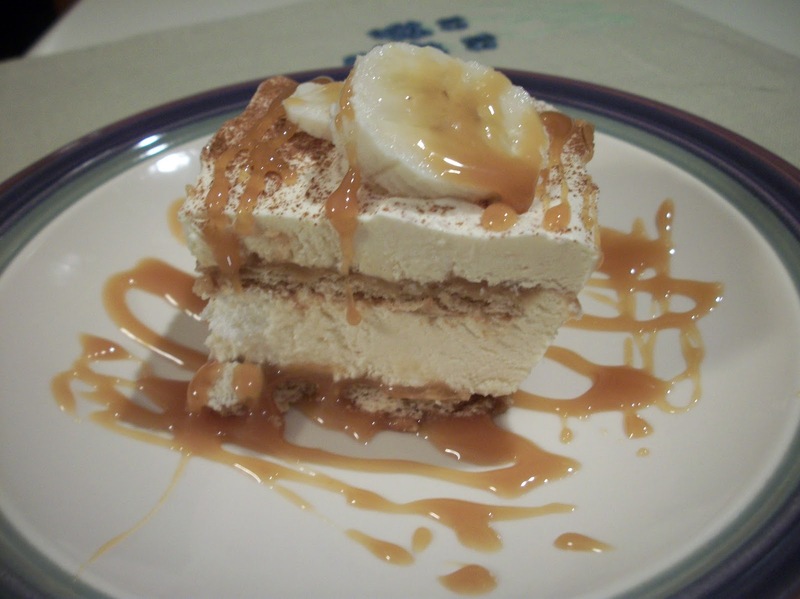 It's similar to the chocolate eclair dessert made with graham crackers - that was a ubiquitous pan of goodness at nearly every church potluck growing up - but this time, bananas mix in with pudding and caramel to create a different, but totally delicious take on that famous dessert. 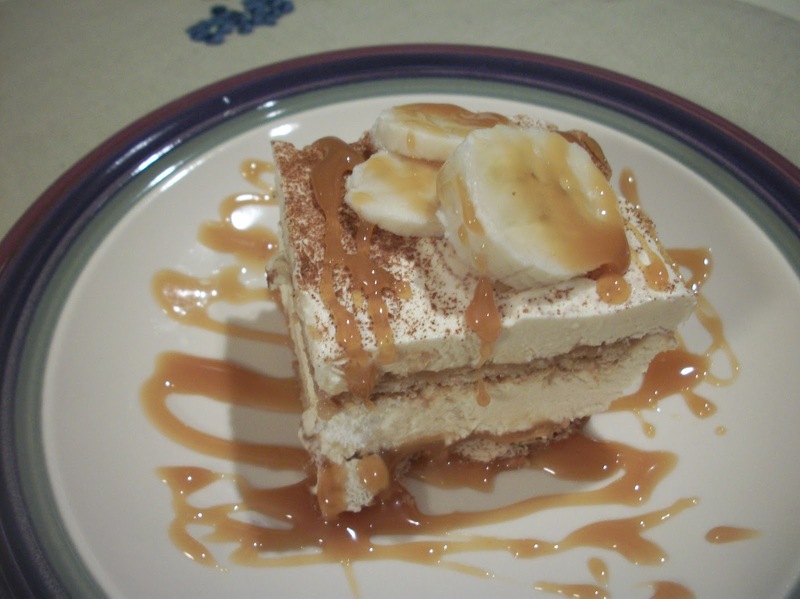 Bananas and caramel are one of my favorite combinations. And they work really well together here. I served this two ways - once just out of the fridge (I made it the night before so it had plenty of time to set up), and once after being completely frozen. I think I like the frozen version just slightly better, but if I had the opportunity, I would allow it to thaw awhile so it's not completely frozen - somewhere between refrigerated and frozen. But don't stress about that - just eat it whenever you can. As often as you can. It does have fruit in it, after all. Find more great recipes at Inspire Me, Inspiration Monday, Mix it Up, Clever Chicks, Tasty Tuesday, Create Link Inspire, Totally Talented, What's Cooking, Full Plate, Showcase Your Talent, Friday Flash, Friday Frenzy, Foodie Friday, Flashback Friday. Combine pudding mix and cold milk in a medium bowl and whisk to thicken. Place the caramel topping in a glass measuring cup and microwave at 50% power for 45 seconds. (This will make it easier to pour.) Add 1/3 cup caramel topping and sour cream to the pudding and whisk to combine. Fold in the container of whipped topping. Arrange a layer of graham crackers on the bottom of an 7x11 baking dish. Top with 1/3 cup of caramel topping. Layer bananas over the top of the caramel. Spread 1/2 of the cream mixture on top of the bananas. Then repeat the layers- graham crackers, caramel, bananas and cream. Sprinkle cinnamon on top and put dessert in the fridge for at least 3 hours or overnight before serving. Freeze if you want to, and thaw slightly before serving with additional bananas on top, as well as a drizzle of caramel.